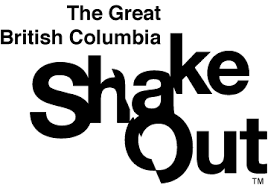 Only few weeks to go until British Columbians "Drop, Cover and Hold On" during the ShakeOutBC earthquake drill October 19, 2017 at 10:19 a.m.
Make sure your participation is counted by registering your family, organization or business at www.shakeoutbc.ca/register. And don't forget that registration is required annually! If you enrolled last year, you need to renew for 2017. Just follow the link above. You can also help drive participation by checking whether organizations in your community are taking part. A list of who's registered is available here: http://www.shakeoutbc.ca/whoisparticipating/. If you don't see local schools, governments or non-profit groups, give them a call and encourage them to participate. Practicing what to do during an earthquake increases the odds people will respond correctly when one occurs. What if you're not near a desk or table during an earthquake? Check out ShakeOutBC's YouTube channel, with videos demonstrating "Drop, Cover and Hold On" for a variety of situations: http://ow.lv/34eB304HFGI. Our new and improved fact sheets also have great advice and tips on how to properly respond and prepare. You'll find them all on our Resources page. As always, check in with us on social media by following on Facebook, Twitter and Instagram, using the hashtag #ShakeOutBC. Thanks again from your ShakeOutBC Organizing Committee.